The temps are feeling more and more like Christmas. Thanksgiving is just a week away now, and we’ll be gathered shortly to celebrate all we’re grateful for. Charlie Brown’s Thanksgiving special will be on soon, the unofficial kickoff to the holiday season. As we’re thinking ahead toward the most wonderful time of the year, we’re exploring a bit more of all downtown Chaska has to offer. As we wandered through some of the first snowflakes, we came across Urban Patina, the home of authentically crafted home decor and gifts. Owners Crystal and Paul have thoroughly prepped the store for the holidays, filling every nook and cranny with everything from wool ornaments to mugs, candles, home decor, and custom handcrafted furniture. Our favorites are the Urban Patina Snowstorm and Woodsman soy candles! 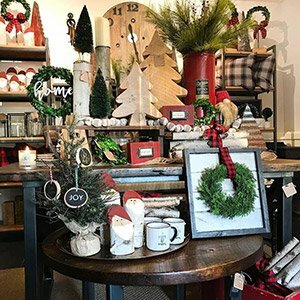 All of their gift options are snuggled into their location off of Chestnut Street, bustling with winter decor and Minnesota-made merchandise. With something for everyone on your list and every corner of your home, Urban Patina is sure to make decorating for the holidays festive and bright! – Visit Body Expressions, 102 W 5th St.
Our last stop of the day was at Shop 501 & Company. The Snowvember weather has started to get everyone in the holiday spirit with all our local shops preparing for the holidays, and Shop 501 is no exception. 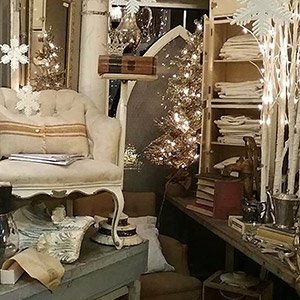 If you’re looking for vintage holiday decor, unusual antiques, or gifts for friends and family, this is the spot. With a combined 11 vendors showcasing their best merchandise throughout the store, they will wow you at every turn and help make your home merry and bright. As we walked through the store, we were reminded of Christmas’s past – the tree at grandma’s house, opening up presents as kids, hot cocoa and sledding. The holiday spirit glows brightly here! Stop in and explore their beautiful pieces from yesteryear and original handmade accessories throughout the store. 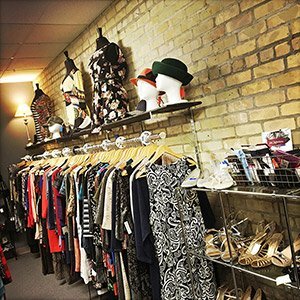 – Visit Shop 501 & Company, 3235 Chaska Blvd. Downtown Chaska definitely has the holiday spirit! We’ll be back in two weeks with some more downtown small businesses that we can support with our local holiday shopping. That most difficult person on your list? Their gift is here downtown! Just a quick reminder as well to mark your calendars to celebrate with us on December 1st for Hometown Holiday in City Square Park – you won’t want to miss it! See you there!